Durham Regatta has appointed its first Artist in Residence. Sue Abel takes up the position the month before the Regatta and will hold office initially for 12 months, during which time she will work on subjects of her own choice for public viewing that capture the spirit of the Regatta. This is an innovative post that provides an opportunity for a local artist working in any medium to pursue a more active career while enabling us to build up a non-photographic archive which can be published on the Regatta website, thus promoting interest both in the work of the artist and in the Regatta as a whole. 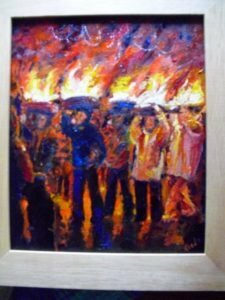 Sue is a figurative painter, working in oils, acrylics, water colours and traditional drawing materials. 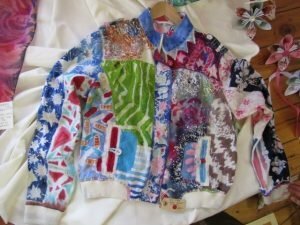 She has a wealth of experience from working in textile design studios and doing freelance illustration before she began painting for exhibition. She has also organised an over-50s Club at Bishop Auckland Town Hall and worked as an Art Tutor for Durham County Council. A career highlight was creating fire sculptures to go up in smoke at a County Council bonfire at Bishop Auckland Rugby Club. 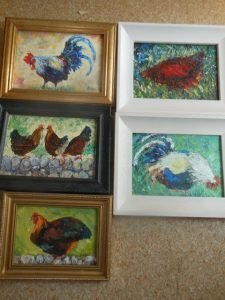 She has participated in painting exhibitions both locally and nationally, while continuing her interest in textile arts in her own studio, particularly batik work and rag rugs of the North East tradition. Examples of Sue’s work are shown below.